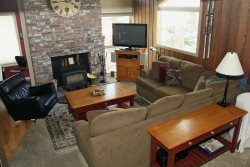 Dog Friendly 1 bedroom and 1 bath condo located in the heart of Mammoth Lakes on the green line shuttle stop to the Eagle Lodge Ski Area. The unit sleeps 4 and has Wifi Internet access . (approx. 800 Sq. Ft.). This spacious ground floor unit is all one level and there are 2 outside stairs to enter the unit. Corner unit is bright with lots of windows to the let the light in. In the bedroom you will find a new king bed (Jan. 2018) and a queen sofa bed in the living room. 2 HD Flat Screen TV's, Living Room and Bedroom. The kitchen is fully equipped and there is a washer & dryer in the unit available for guests. Coin-operated laundry facilities located in the common area near the office. Common Area Summer Heated Swimming pool and Year Around Jacuzzi/Sauna for all Wildflower guests. There is outside parking for 2 cars. COMPLIMENTARY INTERNET and CABLE TV are provided, however NO REFUNDS will be given for connectivity problems or Internet failure. No Phone Land Line. Great location and perfect for the puppy!! Thank you for your great instructions and service. The place was as described. Clean and spacious. The booking agency that runs this listing was proactive with details instructions about how to get there and thier check-in check-out procedures. The site was close to all city services. There is a shuttle stop down the street to the ski resort. There are a Vons, restaurants and outfitters close by as well. Easiest in and place for a weekends trip. The amenities are dated as well as the sofa couch. It was hard to sleep on the sofa couch yet it was very clean. Just old. The kitchen had all the cooking items you need. Just bring your own spices and condiments of you are looking to stay a while and make you own foods. Overall great place to stay.